It’s mid-November, and the bulbs haven’t been planted yet. Shaking my head at the calendar on the wall and reassuring myself with one last google query that it’s technically not too late, the search for a shovel commences. I have no idea where anything is, anymore, and make a trail looping around the backyard, through the gate, back out to the front of the house, looking behind the strange bush no one knows the name of and finally winding up in a dark corner of the garage where the rusty tool leans, looking almost as abandoned and exhausted as I feel. Adding it to the bags of bulbs I’m already carrying in one hand, I put the rake under the other arm and grab a bag of compost in the second, trundling out to the front yard with my load. The “flower bed” is fairly good-sized, but we’ve only been here a few months and it currently boasts just a few lonely sprigs of monkey grass and a ton of tired, greyed mulch. I shake my head, grit my teeth, press the blade into some approximation of design with my foot, and, finding the ground hardened by lack of rain, jump onto the head of the shovel, forcing it deep into solid ground. "Bloom where you're planted." Someone said it to me a few weeks ago and it’s been turning itself round in my head, ever since. I’ve decided I hate that phrase. In the afternoons I sit with my nine-year-old’s English class and learn why; it's an imperative sentence, a command; the "you" invisible but implied. Which is pretty much how it feels when I hear it, some sort of flippant injunction, tossed out as a simple solution when one person thinks someone else is asking too much of life by wanting it to be different than it is. “Bloom where you're planted.” Easy for them to say, whoever they are. I wrinkle my nose and shake my head at the thought, turning over surprisingly dark dirt and jump on the shovel again, forcing it deeper. What does that phrase even mean? Blooming means flowering. Which has to be preceded by growing. Which has to be preceded by rooting. Which, as the stupid sentence already says, implies having been planted. The now-familiar pain comes back, and I realize this is why this command is frustrating me so. Lucky bulbs. Here I am, out in the cold, making a bed for them (we call them garden beds, don’t we?) So I make the bed, choosing just the right spot, carving out a particular place, adding nutrients to the soil, gently setting these bulbs in position with forethought and design and plans to water them in. Me? I’ve just landed here, in this new place, this new house, this new community and culture, by chance; no forethought or planning or careful tucking in sight. These bulbs, they’ll grow (if I’m not too late getting them in, anyway). 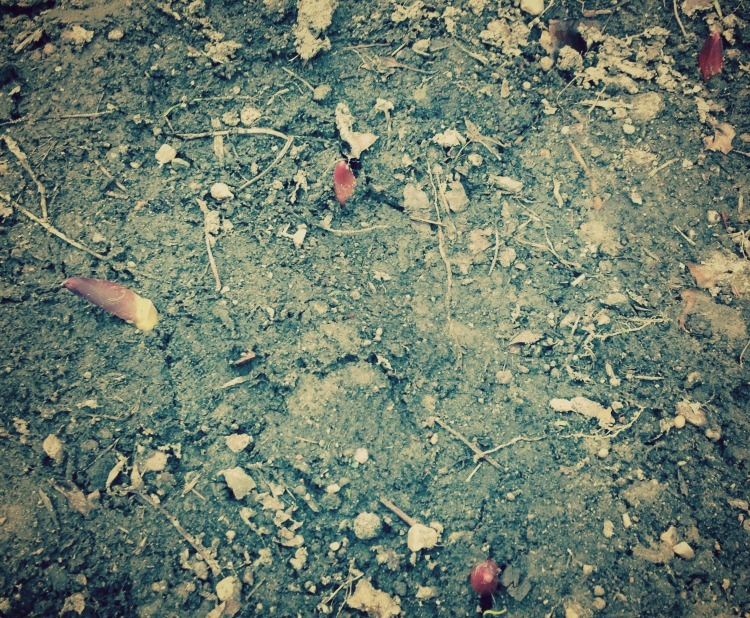 They have no choice; they’re bulbs, after all, and rooting and growing and blooming is what they do. And He spoke many things to them in parables, saying, “Behold, the sower went out to sow; and as he sowed, some seeds fell beside the road, and the birds came and ate them up. Others fell on the rocky places, where they did not have much soil; and immediately they sprang up, because they had no depth of soil. But when the sun had risen, they were scorched; and because they had no root, they withered away. Others fell among the thorns, and the thorns came up and choked them out. And others fell on the good soil and yielded a crop, some a hundredfold, some sixty, and some thirty. He who has ears, let him hear” Matthew 3:3-9 (NASB). Maybe I really have been tossed, after all. I’ve planted bulbs before, and I know what’s coming. Tears come now as I remember the others I’ve left behind, the bulbs planted in the Colorado dark another cold nearly-winter night years ago, when the snow warning came and the bags of bulbs under the sink called to me and I knew it was that night or not ‘til the next fall. Six months went by before I knew if I’d missed the window, but finally April brought rows of green blades poking through snow, followed by yellow and purple and pink saucy heads which danced on every spring breeze. I flip the shovel over and pull the displaced dirt back over each hole, patting it down, making my own declaration of belief, defiant of the evidence around me that everything is decaying. The trees here in the south are still gold and crimson and burgundy, fancy ladies hesitant to take off their finery though the wind is insistent. Is it any wonder that these leaves are so beautiful only because the trees have stopped their work for the season, the chlorophyll fading to reveal all this glory? Are we more like them than we think, with true colors only showing when we rest? The bulbs have no choice but to rest now. After the burying and chilling each will break open all on its own, unseen. Each was created to break on its own; all the splitting hardwired into its being. And after they break, they will begin to grow-- but first down. Before any bloom is possible, there must be breaking. Then the growing down-- the rooting. Then the growing up of the stem. And then, only then, the bloom. decide blooming is the last thing I should be thinking about doing, me, new to this place I wonder if I’ll ever know as home. I’ve been flung here, tossed, and I’m still a bit stunned. The phrase needs a makeover. Perhaps just “Root where you’re flung” would be an improvement. Maybe when it’s cold and dry and everything looks dead and I’d never planned to be here—when I find the world strange and myself strange in it—maybe that’s really all I need to do, too. The water is cold and it’s the bulbs final humiliation. I’ve thrust them deep into a hole, covered them with dirt, and now they’re chilled and wet.